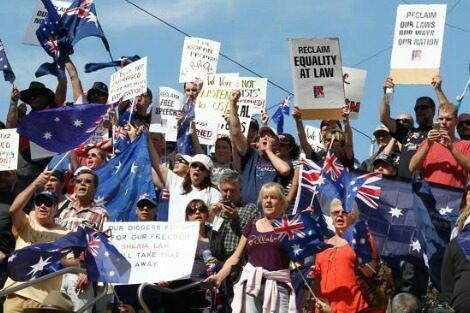 For the last few years, Reclaim Australia and other white-nationalist groups have held rallies to protest Australia's immigration policies, the building of mosques and, more recently, in support of US President Donald Trump. Each time, there have been counter rallies of socialists, refugee advocates and anti-racism groups. When these protests began, I grappled with whether or not to join the counter rallies. Some of my friends — people who I have stood next to on picket lines and marched in demos with — were enthusiastic participants, confronting the purported neo-fascists. These friends send me text messages the week before the rallies, or share 'event invitations' on social media. The invitations sometimes have a sickly tone of excitement in them. 'Come and fight some fascists, it will be fun!' one friend texted me in the lead up to one of the confrontations. In the wake of the skirmishes, my social media feeds are peppered with videos and photos of the day's highlights. From the beginning, I was ambivalent about participating. I find the views of the white-nationalist groups abhorrent, but I saw them as marginal fringe groups of (mostly) white men who were only getting attention from the media because the conflict with the counter protesters made for good content. Why validate their cause by gifting them coverage? Why animate them by giving them somebody to organise against? One Sunday last year, the day after a particularly violent confrontation between the groups, I began work at 7am in my then role as a residential care worker with homeless teenagers. Work was quiet and I began scrolling through the news coverage, voyeuristically wondering if any of my comrades featured. "The anti-racism campaigners thought they were right because they fought fascists; no matter if the apparent fascists were homeless children who had been coaxed into participating with lies and predation." To my horror, I knew people on both sides of the scuffles. As expected, my socialist and trade unionist friends were there clashing with the police and the white-nationalists. Completely unexpected was a handful of my homeless clients, draped in Australian flags, engaged in rolling street battles with the anti-racism protestors. When I approached the young men — they were all men — they answered their doors with eyes red from pepper spray. I sat with them while they explained how they came to be involved in the protests. They showed me Facebook messages from prominent white-nationalists who had convinced these teenagers that immigrants were the cause of their homelessness, their unemployment and their alienation. They described how good it had felt to confront what they were convinced was their enemy — for once in their lives they had felt powerful. What struck me were the similarities between these conversations and the ones I had with my progressive friends. Both sides participated to make themselves feel good, not to change anybody's mind. The anti-racism campaigners thought they were right because they fought fascists; no matter if the apparent fascists were homeless children who had been coaxed into participating with lies and predation. These young men had experienced alienation, exploitation and poverty. All the things the Left is supposed to fight against. They struggled to find meaning in their lives. And tragically, they found meaning in fighting — literally — the people who purport to care the most about the disenfranchised: socialists, trade unionists and the Left. Over the next several weeks, and a number of conversations, other youth workers and I were able to convince the young men that the cause they had been cajoled into supporting was wrong. They came to understand that while their anger was justified, it had been misdirected. When I told this story to a friend who was involved on the anti-racism side he was unperturbed. Fascism has to be crushed, not discussed, he told me. I pointed out that the young men were the victims of the same forces we opposed: rapacious capitalism, an indifferent bureaucracy and family violence. That didn't matter — he was content for these young men to be collateral damage in a bigger struggle. But I remain convinced that persuasion and discussion can't be abandoned. Long, uncomfortable conversations don't make for good social media content but that does not allow us to dispense with them. If Australia is to stare down the threat of a rising alt-right and work towards building a good society, we must work to address the material conditions that nourish hateful movements. This won't be done by yelling at right wing fringe groups across a police barricade. The slow grind of organising efforts for workers' rights and decent, affordable housing is probably a better place to start. Daniel Nicholson is an Industrial Relations researcher at the University of Melbourne and a Director at the progressive think tank the John Cain Foundation. Previously, he has worked as a youth worker and a trade union organiser. He has previously published in Overland and The Conversation. Recent articles by Daniel Nicholson. In general an excellent and insightful piece. I am not sure that Reclaim Australia are in essence a racist group per se. They are certainly extremely right wing though. I suppose there is a narrow border between extreme right wing and racist. Likewise, the use of the word 'fascist' to me connotes something like National Socialism in Germany or the Falange in Spain. These are groups that espouse a particular form of authoritarian government. Some of the 'anti-racist' supporters seem to be aligned with Trotskyite organisations. I am a wee bit concerned about some of the Greens - particularly from their NSW branch - who also appear to be connected with anti-racism but who espouse radical left wing neo-Marxist 'solutions' to our economic problems. Allying with either is, to me, sleeping with the devil. Apart from this criticism, I found your piece remarkably sane, mature and insightful. I hope you get a wide readership, especially amongst young people like the youths you work with. We need to try to solve our perceived national problems with sanity and insight like yours. Thank you Daniel for a very mature and insightful overview of humanities ability to repeat the same old mistakes. Each generation spits out the same percentage of good bad and ugly. You are correct that evolution is much more mature then revolution and therefore language is vital. If you cannot win the hearts and minds with vision and language; being right is irrelevant. Snake oil salesmen have been around since Adam was a boy and simple one liners are very attractive if you are confused about your plight. National Socialists were clearly anything but Socialist and were quick to attack organised labour (unions) but that did not stop most workers following Hitler. It is all happening again and we need people like you Daniel with the vision to understand the complexities.Getting angry and violent is the easy simple and dumb response but it will be the response of the majority. My struggle with all this has past. I wish you all the success possible;our civilized; peaceful future is relying on people like yourself. I'm with you Daniel but I'm in a quandary about activism after 45 years of protest and nearly 20 years working for pollies or as a bureaucrat to bring about changes from within. It all seemed so easy when I was marching down the Auckland docks to the (presumably) nuclear US warship carrying a placard 'Yankee welcome ship go home'. In NZ in the 70s, protest was a mainstream peaceful activity and I marched with suited businessmen, nuns, mums and dads, and the usual hairy peaceniks. The government supported us and we were chucked out of the ANZAC Treaty (mysteriously still called that). Now I'm afraid that the open viciousness and aggression on both sides will lead me into the very thing I'm trying to stop. What to do? Nobody's listening to reasoned persuasion, just reacting with their guts. Very good article blemished by associating fascism with skin colour. I wonder if fascist nationalism happens in countries where the population is predominantly dark skinned. A wonderful piece. We have no permanent allies only permanent interests a wise person said. These youth were acting from their interests and were misdirected. Aren't we all capable of this from time to time. This piece talks not to just this situation but to so many of the ways we respond to life. Keep posting. I really appreciated your article, Daniel, including your understanding of how these young people have been victims of, " rapacious capitalism, an indifferent bureaucracy and family violence." And I totally agree that, "we must work to address the material conditions that nourish hateful movements." Very timely writing. Thank you. Daniel, your article reminds me of George Orwell when he wrote "The Lion and the Unicorn: Socialism and the English Genius" in 1940. It is only 83 pages long. I recommend it to anyone who wants to get some insight into the exploitation of emotion in politics. Orwell wrote: "One cannot see the modern world as it is unless one recognizes the overwhelming strength of patriotism, national loyalty." His essay begins: "As I write, highly civilized human beings are flying overhead, trying to kill me." Let's hope the protests and counter-protests you have reported on don't develop into a civil war, or, worse still, an international war. The theme for this year's International Women's Day is 'Be Bold For Change'. This involves an aspiration for action, assertiveness urgency. Because the changes required are considerable, in number and in scope. Statistics still reflect a 16 per cent gender pay gap. While there has been some movement of gender diversity on boards (25.3 per cent as at 31 January 2017), only 17 per cent of CEOs in Australian companies were women. The attitudes that underpin such dire statistics run deep.